No typo there – Yes, there’s three e’s, because it’s just that simply sweet! 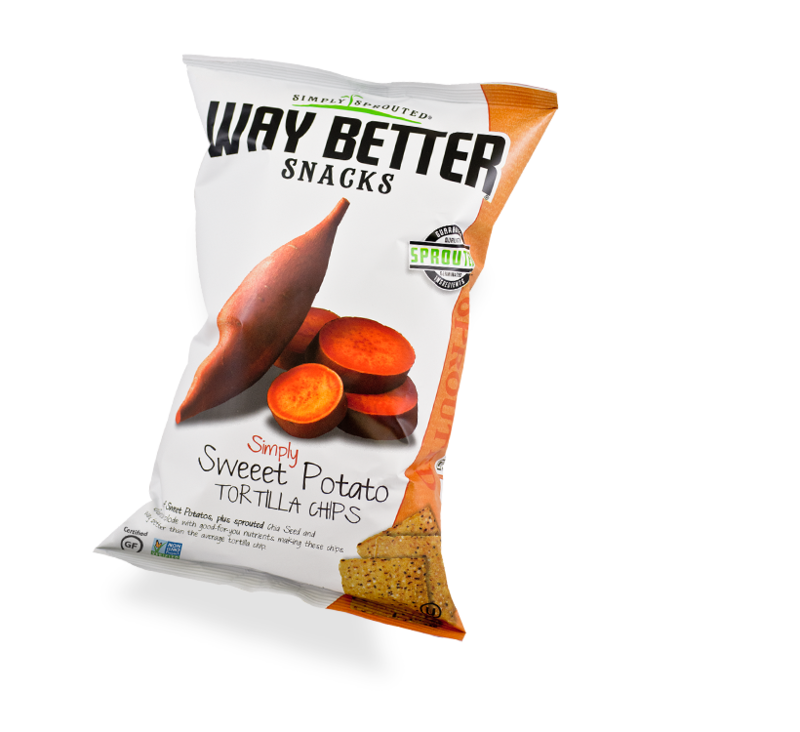 What caught my eye is the growing trend in sweet potatoes, and what’s perfect in this case is that it’s now in a crunchy, chip form! Made with simple ingredients, there’s a light sweetness to the sweet potato tortilla chips. They are similar to the usual corn tortilla chips that one would expect to find, while also with a decent thickness and excellent crunch factor. So these would actually work great with a light dip. However, I simply enjoyed them just on their own, because I really enjoyed the sweetness to it. I did find that there is a bit of a heavy hand on the salt, but it isn’t too overpowering. Near the bottom of the bag – and yes, I reached the bottom of the bag pretty quickly – the salt was more apparent in taste. Cost: $3.79 for 156 grams. Value for Cost: A bit higher than average. Availability: Major grocery stores, health food stores and selective number of drug stores. Nutrition: For 1.25 ounces: 170 calories, 9 grams of fat, 125 mg of sodium, 20 grams of carbohydrates, 3 grams of fibre, 0 grams of sugar, and 3 grams of protein. Overall: Excellent just on their own with a light sweetness. When it comes to chips, yes, I can easily – very easily – go overboard, without a doubt! And so, any opportunity to boost the nutritional benefits, or just give me an extra excuse to indulge, I’m all in! Beantios offers exactly just that. 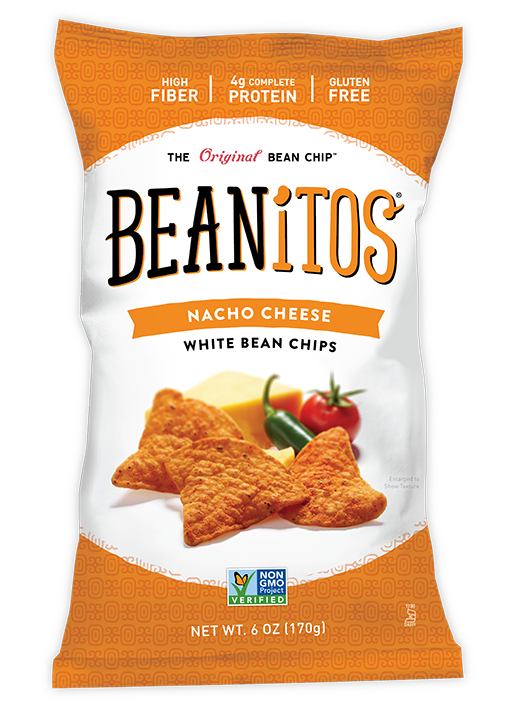 The white bean chip variety, with a Restaurant Style and Nacho Cheese, which both provide an excellent crisp and crunch with boost of fiber and protein. 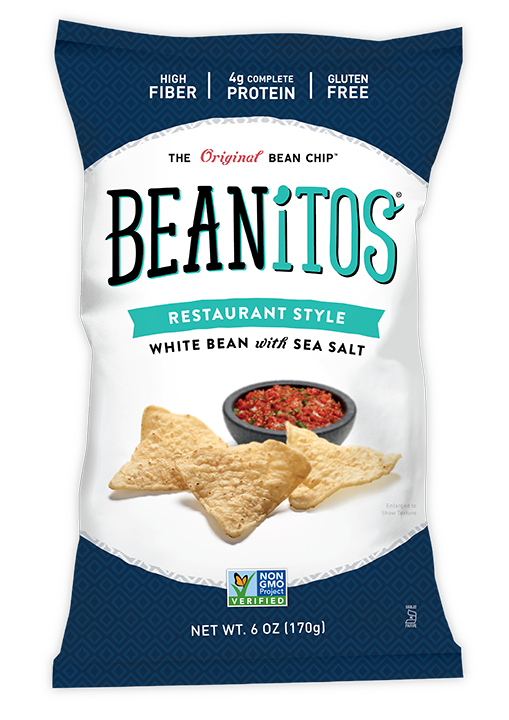 The Restaurant Style is great paired with salsa, and are just like regular white corn tortilla chips, but a bit thinner. While both are gluten-free, the Restaurant Style is also vegan-friendly. The Nacho Cheese variety has a great balance of cheesy flavor and are great just on their own. Cost: $3.99 for 170 grams at London Drugs. Availability: Major grocery stores, health food stores and online. Nutrition: For 12 chips (28 grams) restaurant style flavorr: 140 calories, 7 grams of fat, 55 mg of sodium, 16 grams of carbohydrates, 6 grams of fibre, 0 grams of sugar, and 4 grams of protein. Overall: They be afraid of beans. In fact, these make beans just more appealing! Thin, crispy, and fresh tasting cookies. Now those are the types of cookies I enjoy. And what’s perfect is that Tate’s Bake Shop is known for simply just that! The classic chocolate chip cookies are very close to feeling just like home-made cookies. Crispy cookies that are not chewy – just how I like them. On the first tasty bite, there’s a delicious buttery taste with generous amounts of semi-sweet chocolate chips loaded into the mix. Sure enough, you can definitely taste the difference between these high-quality cookies compared to what you’ll find in store shelves. 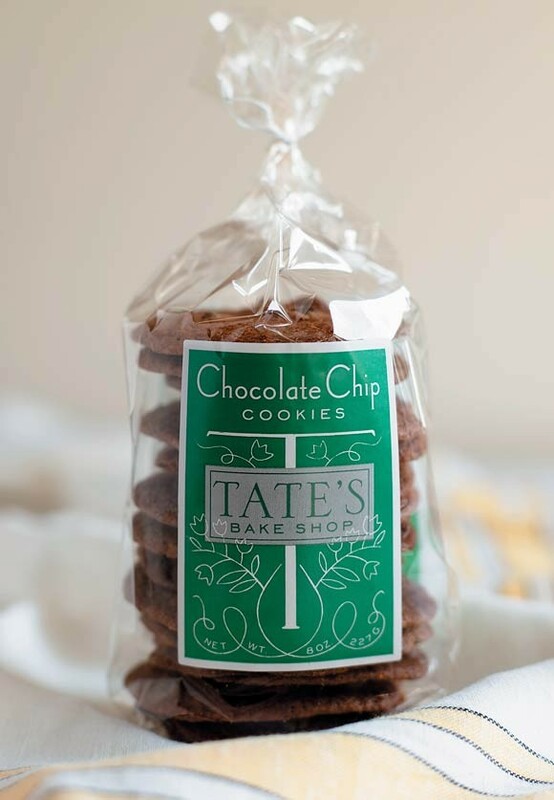 There’s even gluten-free chocolate chip cookies made with rice flour by Tate’s Bake Shop. These melt-in-your-mouth delicious cookies taste great. It’s also quite difficult to suspect that these are gluten-free as well. They taste just like the regular version with a very delicious buttery taste. You can freeze both the regular and gluten-free cookies, but I highly doubt that happens often. Cost: $7.50 for 220 grams (Chapters). Value for Cost: Don’t expected store shelves cookie pricing, because after all, they certainly don’t taste like it. However, these do come at a higher price tag. Availability: Selective retailers and online. Nutrition: For 1 cookie (14 grams) chocolate chip: 80 calories, 4 grams of fat, 80 mg of sodium, 9 grams of carbohydrates, 0 grams of fibre, 6 grams of sugar, and less than 1 gram of protein. Overall: No baking required for these delicious, crispy and thin cookies – Just like how Grandma would have made them. Barbecue flavored chips is a classic. Growing up, it was one of my favorite all-time flavors for potato chips. It’s that light smokiness with a hint of sweetness that tastes great. It’s simply a classic. The Tangy BBQ flavor by Riceworks has a great tangy barbecue flavor with some minor notes of sweetness. There’s a perfect amount of seasoning to these thick, whole-grain chips. So, don’t worry about experiencing any inconsistency in seasoning flavor on chips, because no one likes that. And because these chips are made from brown rice, there is a really nice hearty and nutty taste to the chips that play very nicely with the light smokiness from the barbecue flavor. Plus, there are some nutritional boosts compared to regular potato chips. And you’re also not sifting through a completely strange list of ingredients either. Cost: $2.50 for 156 grams at Shoppers Drug Mart (on sale). Nutrition: For 15 chips (40 grams): 190 calories, 9 grams of fat, 180 mg of sodium, 27 grams of carbohydrates, 2 grams of fibre, 2 grams of sugar, and 3 grams of protein. Overall: Great barbecue flavor with a light sweetness, and it plays very nicely with the nutty flavor from the brown rice. Organically grown, fair trade and delicious chocolate! Now that’s a wonderful combination that one cannot resist. I know I couldn’t, because after all, we’re talking about delightful chocolate here. And there’s no such thing has having too much chocolate. Ever. 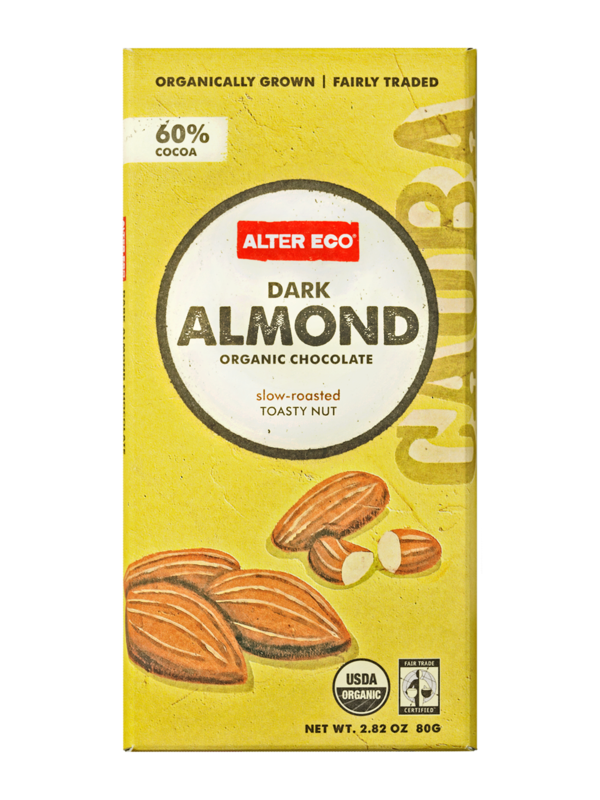 The Alter Eco Dark Almond Organic Chocolate is simply delicious. Slow roasted, toasted almonds pieces are paired very nicely with the light bitterness of the 60% cocoa chocolate. It melts very smoothly. The small almond pieces also adds a nice crunch as the notes of sweetness followed by a mild bitterness hit your palette. Although I was expecting large pieces of whole almonds in this chocolate bar, I was very surprised how much I enjoyed the small pieces instead. 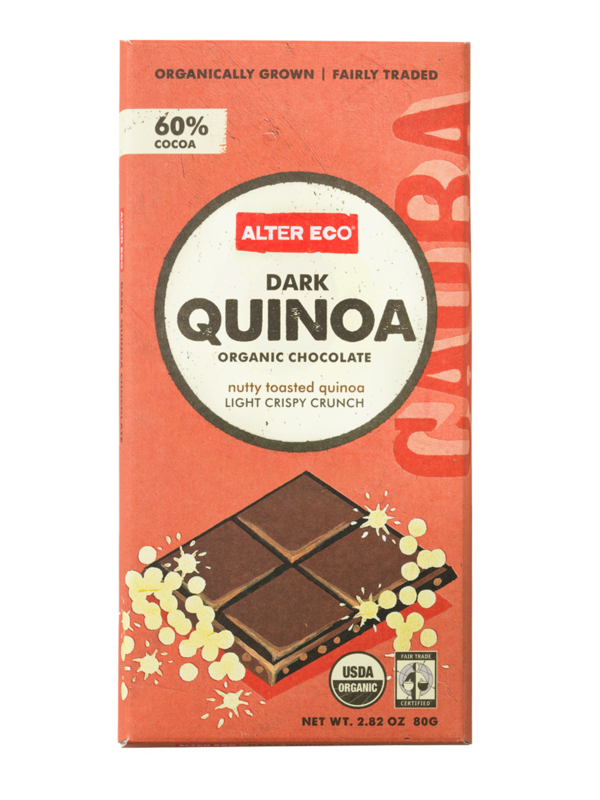 Another delight is the Alter Eco Dark Quinoa Organic Chocolate. The quinoa is light and crispy, which reminds me one of my childhood chocolate bars, the Nestle Crunch, that I used to enjoy. Growing up when grocery shopping with my Mom, sometimes she would let us choose a chocolate bar as a treat. And for me, it was the Nestle Crunch. With Alter Eco, it’s much smoother and creamier. With quinoa as the specialty ingredient, it makes it more elite and sophisticated – An adult-version of the Nestle Crunch. Cost: $3.99 for 80 grams. Value for Cost: Excellent, because this seriously is amazing chocolate. Nutrition: For 5 sections (40 grams) dark almond: 220 calories, 16 grams of fat, 2mg of sodium, 19 grams of carbohydrates, 4 grams of fibre, 14 grams of sugar, and 3 grams of protein. Overall: Made with only a handful of simple, straight-forward ingredients, these are purely delicious chocolate combinations. Chips are certainly not just chips, because I do eat my fair share a little too often. Maybe having stretchy pants isn’t really a good thing after all, but to help with the feeling of “oh-man-did-I-just-eat-that-entire-bag”, sometimes having those healthier options (or seemingly healthier) makes it seem less of a situation full of gluttony. 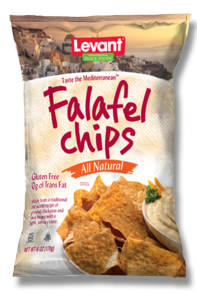 Levant Falafel Chips are gluten-free and are made primarily with a blend of corn, chickpeas, fava and rice flours. They are also lightly sweetened with honey. At first, the spices and flavor really didn’t taste like much. It was quite bland in flavor for a bit, in fact. But after a few more bites and a few chips later, there is an increase in flavor, and slowly the herbs start to kick in. However, it’s quite mild in flavor. So, these falafel chips work well if you’re looking to pair chips with dip, but do not have the chips overpower the dip. Cost: $3.49 for grams at Bulk Barn. Availability: Major grocery stores and health food stores. Nutrition: For 28 grams (10 chips): 150 calories, 8 grams of fat, 70 mg of sodium, 17 grams of carbohydrates, 3 grams of fibre, 0 grams of sugar, and 2 grams of protein. Overall: Don’t expect a huge flavor kick, but rather as a sidekick and vehicle for dips. Move over corn tortilla chips, because there’s something better in town! It’s always exciting to see new products with a twist to our traditional expectations of snack chips being made solely from either corn or potatoes. What I look forward to in the case of Flamous Chips are that they’re organic, gluten-free and vegan. And of course, all three varieties taste exceptionally delicious. The Original Falafel Chips pack delicious flavor. They’re thick and crispy. They definitely hold thicker dips very well, but they are also delicious just on their own. In fact, I can easily enjoy them without any dipping action whatsoever. This can’t be said with the typical tortilla chips, because those often just taste like salted, plain chips. For the original falafel chips, they’re great tasting, full of flavor and seasoning. If you’re up for a spicy kick, the Spicy Falafel Chips are loaded with a nice punch of heat with great notes of herbs and seasoning into the mix. Like the original flavor, these spicy falafel chips are great on their own. The Zatar Chips are made with brown rice, flax and buckwheat and have a light blend of spices. What I find great is that all three varieties are not overloaded with sodium. So even after those moments of having a few too many servings, you’re not left with a sodium overdose that typically happens with many chips. Cost: $4.99 for 227 grams. Value for Cost: Reasonable, but they are a bit higher in price point – They are organic and have nutritional stat that are a bit better than the traditional chips on the market. Nutrition: For 28 grams (approximately 11 chips): 118 calories, 6 grams of fat, 80 mg of sodium, 16 grams of carbohydrates, 4 grams of protein, 1 gram of sugar, and 4 grams of protein. Overall: These exceptionally thick chips have great flavor. Plus, they are some nutritional benefits as well. So no worries, feel free to eat a few more handful of chips, because I certainly have already. A popular dairy-free alternative to butter is Earth Balance Original Buttery Spread. Upon trying this, it spreads very well on toast and melts smoothly. The original buttery spread doesn’t have a strong taste. Rather, it tastes a bit mild in flavor with a creaminess that does resemble butter very well. The salt level isn’t overpowering and doesn’t taste artificial. And just like butter, you can toss your popcorn using this very easily by simply melting and drizzled it over your popcorn. The Mediterranean whipped buttery spread also has a nice consistency with a hint of olive oil compared to the original flavor. I can’t say that these are completely healthier alternatives to butter. Nutritionally, they boost roughly around the same calories as regular butter. However, they are cholesterol free, and can easily be used from cooking to baking. So, there’s really no excuse not to bake some double chocolate chip cookies or oatmeal raisin. I’d go for oatmeal raisin right now, so feel free to bake a batch at anytime. Cost: $4.99 for 426 grams at Sobeys. Nutrition: For 1 tablespoon (14 grams) original buttery spread: 100 calories, 11 grams of fat, 100 mg of sodium, 0 grams of carbohydrates, and 0 grams of protein. Overall: A great alternative to those that are looking for a dairy-free option to butter. But just like butter, maybe – just maybe, don’t go spreading this on everything for the sake of everything, if you know what I mean. Theobroma Chocolat is a company that focuses on using recyclable and renewable materials whenever possible and support sustainable farming. They really try to balance the value they place on producing quality chocolate, while also thinking about our planet. I am also a fan of their product packaging design. Given the long-shape, it is easy to break into smaller pieces, but let’s be honest, I am not always willing to share. The 72% dark bar is excellent on its own, with great smoothness and melts nicely in your mouth. The flavored bars start off with a foundation of 60% dark chocolate, which is great because I find that around this range, it doesn’t overwhelm the palette, but balances the taste of any additions, such as fruits or nuts. For the coconut chunks, there was great flavor and a bit of crunch from the specks of coconut with a slight chewiness. The raspberry chunks has a nice fruity taste, that turned out a bit better than what I had expected. And for a coffee kick, the espresso coffee chunks has a note of coffee, but it lack some vibrancy and freshness I wanted. I can’t say I was a fan of the banana chunks, but that may be because I am typically don’t go for bananas-flavored things, or the combination of chocolate and bananas either. But if you’re into it, try it. As for the orange chunks, it was also a citrus fruit and chocolate combination that I don’t always steer towards. Kind of reminds me of orange juice, really. And with a bit of crunch at the end. Cost: $2.76 for 35 grams. Availability: Limited retail locations, and available online. Nutrition: For the 72% dark bar, 1 bar (35 grams): 180 calories, 13 grams of fat, 3 grams of sodium, 11 grams of carbohydrates, 4 grams of fibre, 10 grams of sugar, and 3 grams of protein. Overall: Depending on your choice of flavor, these are reasonably well made chocolate bars – although, maybe I just had very high hopes for these before unwrapping them to try. It’s a twist to the typical pretzel! I am a big fan of crunchy snacks, and Pretzel Crisps definitely do not fall short of that, since they are basically flattened pretzels! And being flattened, you’re sure to get a crunch. Plus, you can easily dip them or spread something over top. Ever dipped your pretzels in peanut butter before? I have yet to try that, even though I’ve seen it done. But of course there’s the option of chocolate too. The original deli style flavor is basic, simple and quite light tasting. It is a bit saltier than what I would have liked, but it’s a crispy pretzel nonetheless. The everything deli style flavor is loaded with poppy seeds, sesame seeds, onions, and garlic. It reminds me exactly of a those everything-flavored bagels, but just in a tasty pretzel form. Sesame deli style flavor was quite mild in sesame, but tasted lighter compared to the original deli style. Maybe it was the lower sodium. If I had to choose, I would prefer this one over the the original deli style flavor. For a greater flavor punch, the buffalo wing deli style flavor is excellent for that. It was loaded with a tangy and sweet flavor, but then after, you get a mild spicy buffalo kick. Another flavor kicker is the jalapeño jack deli style, which combines some great heat with a slight cheesy taste. There’s definitely spice, but it’s not overpowering to the palette. For more cheese, the chipotle cheddar deli style flavor was great for that. There was a slight smokiness, but not much spice as I would have thought. Cost: $2.50 for 204 grams. Availability: Major grocery stores in the deli section. Nutrition: For 11 crackers (28 grams) original deli style flavor: 110 calories, 0 grams of fat, 330 mg of sodium, 23 grams of carbohydrates, 1 gram of fibre, 2 grams of sugar, and 3 grams of protein. Overall: A blend between the traditional pretzel and a cracker – Really, the best of both worlds that doesn’t fall short of flavor and crunch. The original deli style, everything deli style and sesame deli style are also vegan.